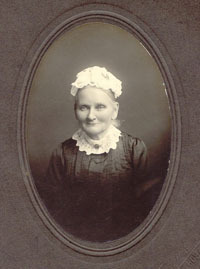 Elizabeth was born in Hobart Town on 4th October 1837 to Thomas Todd Cooley and Margaret Cooley (Edmondston). Elizabeth's middle name comes from her maternal grandmother who was Elizabeth Allen. Our family are very lucky to have in our posession, some original letters written in the middle of the 19th century! The ones below are trancripts of letters held by family member, Gillian Tansley. They are all addessed to Elizabeth as she was approaching her 16th birthday. The first one is from an unknown person, possibly a close female friend judging by the tone of the letter, the second from her mother (who incidentally calls herself Mary and the last one from her brother, Thomas Charles Cooley. It sounds as though Elizabeth was at school and boarding with a Mr and Mrs Brooks, possibly in Launceston. I have been waiting for an answer to my last letter, untill I begin to think I shall not get one. I want to know particularly the prices of the fly capes as I thought of getting some for Mr Bazaar. I hope you are all well and that your Mamma has lost her rheumatism. Poor [Sally?] is not any better she likes the change in the weather and still goes for a drive when the days are fine. I've helped her up today. I now write to you hoping it will find you in good health as it leaves us at present. Now as your birthday is fast approaching I wish you many happy returns of it, may God bless you and protect you through life is the prayer of your affectionate Mother. There have been many changes since I wrote to you last. Mr Fibering and Matthew Crouch are both dead, his poor mother feels it very much and has sold all her property on that account. Father has sent you a Birthday present with a little green in it, wishing you many happy returns of Your birthday and I have sent you a cake and also two sovereigns for pocket money and pay for the making of your frock and ask Mrs Brooks if she will be so kind as to buy you some black silk to make a jacket if you wish. Give my kind regards to the Miss Waddells, I have enclosed £5 for your music. Give your Father's and my kind regards to Mr and Mrs Brooks and all the family and ask Mrs Brooks if she received the White China Primrose that I sent by one of Mrs Bells tenants this week after Mr Brooks went home. Your Brothers and Sisters wish you many happy returns of your birthday and send their kind love to you and accept the same from me. P.S. My dear Sister, I suppose you have heard of the arrival of our "Iron Steamer Tasmania", she has made some good voyages to Victoria. Mr Feends horse "Patient" died last week. Please to send an answer as soon as convenient. Mother sent you up a box last Saturday week per "Lords Coach" and as we have not received a letter from you, we doubt whether you have got it. It was directed to Mr Brooks and the contents of it are two frocks, one habit shirt, one neckerchief , cake and £5 for Your music and 2 sovereigns for yourself and if you have not received them ask Mr Brooks if he will be so kind as to see about them. We wish this may find you and Mr and Mrs Brooks and all the family quite well. P.S We have had very bad weather down here for there has been continual rain for near three weeks and it is raining now. T.C.C. 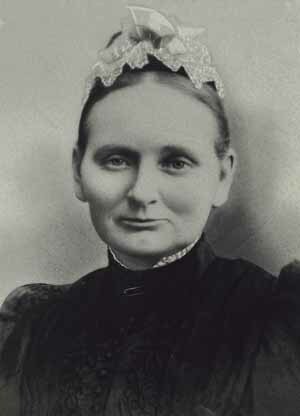 On 26th July, 1862 Elizabeth married William Barlow and they had 6 children. The eldest, Elizabeth is my great grandmother. 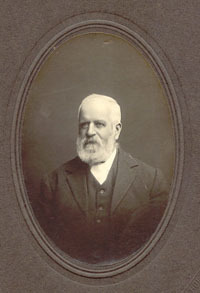 At a later date I will provide links to pages of information for the FULLER, WHITE, COOPER and ANDREWARTHA families. William and Elizabeth celebrated their Golden Wedding anniversary in July 1912 (see pictures below) and to commemorate the event they had this beautiful little card made up. It has an outside card cover and inside the following inscription is printed on cream tissue. 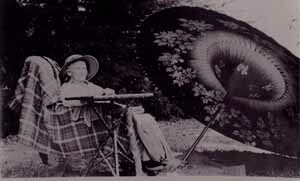 This photograph was taken toward the end of Elizabeth's life. She is sitting in the gardens of her home "Angaston" at Moonah, Tasmania (c1921). 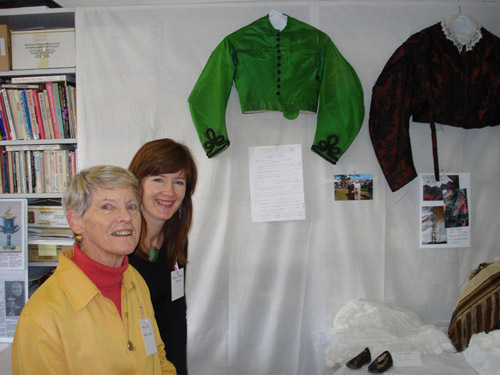 In May 2008 a donation was made to the Tasmanian Museum and Art Gallery or a number of clothing items belonging to Elizabeth. 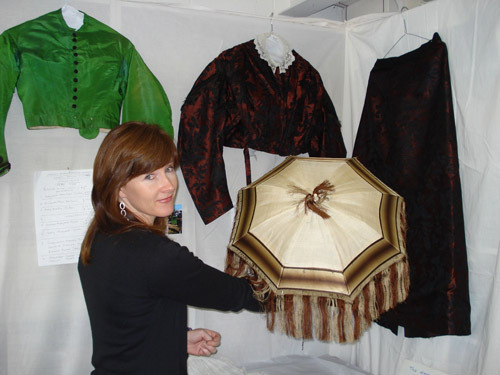 Kerry Ilsley (nee Morse) handed over the beautiful garments some of which are pictured here. Also in the picture is Kerry's niece Jacquie.